The present paper, after providing a brief description of the recently developed analytical tool for assessing vulnerability of RC (reinforced concrete) structures to earthquake triggered earth slides, focuses on the exploration of the reliability and applicability of proposed procedure through its application to a real case study. In particular, the approach is implemented to a representative RC building located near the crest of the Kato Achaia slope where most of the structural damage was concentrated in consequence of the Ilia-Achaia, Greece 2008 (Mw = 6.4) earthquake. Both the structure and slope configuration are realistically reproduced using non-linear constitutive models to estimate the vulnerability of the reference building and to assess the validity of the developed methodological framework and the corresponding fragility relationships. In terms of numerical simulations, the analysis involves two consecutive steps: (a) estimation of the differential permanent deformation at the foundation level derived through a finite difference, non-linear, slope dynamic model and (b) static application of the computed differential displacement at the building ‘s supports via a fibre-based finite element (static time history) analysis. The proposed probabilistic fragility curves were found to adequately capture the simulated and recorded performance of the representative RC building affected by the slope co-seismic differential displacement. 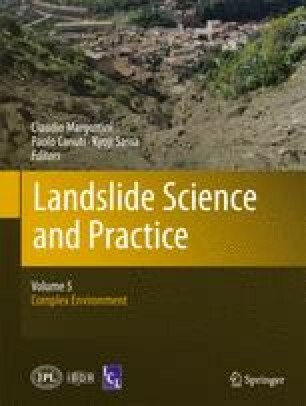 The work described in this paper was supported by the project SafeLand “Living with landslide risk in Europe: Assessment, effects of global change, and risk management strategies” under Grant Agreement No. 226479 in the 7th Framework Program of the European Commission. This support is gratefully acknowledged. Furthermore, the authors would like to express their sincere thanks to Professor George Athanasopoulos and Helen Pefani (University of Partas, Civil Engineering Department) for providing most of the data used for the specific study area.